The Wakulla Springs Lodge offers overnight accommodations, a spacious dining room, six meeting rooms, snack bar and gift shop. Built in 1937, the lodge features marble floors, an ornate lobby ceiling and antique furniture. The facilities are open to the public year-round. Wakulla Springs Lodge provides a tranquil environment for banquets, conferences, retreats, receptions or weekend getaways. For more information or to make reservations, please contact Edward Ball Wakulla Springs State Park, 500 Wakulla Park Drive, Wakulla Springs, Florida 32305; (850) 224-5950. One of the world's largest and deepest fresh water springs highlights the 2,860-acre Edward Ball Wakulla Springs State Park. The bowl of the spring covers approximately three acres. The water temperature remains a relatively constant 70 degrees year-round. A record peak flow from the spring on April 11, 1973 was measured at 14,325 gallons per second - equal to 1.2 billion gallons per day! Visitors may observe the natural serene beauty of the Wakulla Spring and river from boat tours offered daily. Two types of boat tours are available. The glassbottom boat, operating when the water is clear, allows visitors to view the deep spring and clearly see the mouth of the cavern 100 feet below. An abundance of fish and a few fossilized mastodon bones can be seen in the spring depths. The pristine river and sanctuary provide a natural habitat for an abundance of wildlife. The three-mile riverboat tour offers a chance to observe alligators, birds, turtles and occasionally white-tailed deer and wild turkey. Florida state parks fulfill an important purpose as examples of the "original natural Florida." The remarkable clarity of the water flowing from Wakulla Springs permits unlimited viewing of the lush growth of underwater vegetation. This growth supports an extraordinary abundance of wildlife. 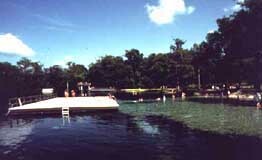 Wildlife is one of Wakulla Springs' chief attractions. The shallow marshes on the river provide a rich natural habitat for native birds, including limpkin, purple gallinules, heron, egret, bald eagle, anhinga, osprey, black and turkey vultures and numerous other species. During winter months, the river attracts thousands of migrating water fowl including American widgeon, hooded merganzer and American coot. Not surprisingly, the park has been a popular "birding mecca" over the years. Other natural features include old-growth floodplain forests, extensive upland hardwood forests and a longleaf pine forest. These plant communities support a large deer and turkey population. Located within the hardwood forest are three state champion trees, the Sassafras, American Beech and American Basswood. The Wakulla River is home to a remarkable variety of wildlife, including alligators. These animals reside in an area protected from human intrusion and may be dangerous. Access to the river within the park is restricted to tour boats only. Scientific interest in the spring began in 1850, when Sarah Smith reported seeing the bones of an ancient mastodon on the bottom. Since that time, scientists have identified the remains of at least nine other extinct Ice Age mammals, deposited as far as 1,200 feet back into the cave. The great depth and clarity of the spring has also made it ideal for deep diving research. Several projects have been undertaken at the spring that have led to significant advances in diving technology and safety. Professional dive teams have explored the spring cavern to a depth exceeding 300 feet and a distance of 12,000 feet. They found the cavern branches into four conduits, but the source of the spring still remains a mystery. Picnic areas including tables and grills are provided within the park. Nature trails located along the park drive provide convenient access to the many plant communities found in the park. A six-mile hiking trail is provided through the use of park service roads. Swimming is allowed only within the designated swimming area near the spring. An observation and diving platform at the spring head allows a splendid view of the spring. A variety of educational and interpretive ranger-led programs are offered throughout the year. Please contact the park for a list of events. All plant and animal life is protected in state parks. Please do not remove, deface, mutilate or molest any natural resources. For your safety, the regulations prohibiting the feeding of animals in all state parks are enforced. For safety reasons, recreational diving is not permitted.